Each year, St. Patrick’s Day falls on March 17 and honors Ireland’s patron saint. The Bay Area offers a number of opportunities for families to celebrate the holiday and revel in Irish culture and heritage. Families can choose to anything from watching a music and dance filled parade, running a scenic race or catching a leprechaun leap out of a helicopter. Here are five family-friendly Bay Area St. Patrick’s Day events. Date: March 11, 2017 at 10:00 a.m. This year marks the 166th annual San Francisco St. Patrick’s Day festival. The festivities will kick off with the parade at 11:30 a.m. The parade, replete with more than 100 dance troupes, floats and bands, will begin at 2nd and Market Streets before winding its route to end at the Civic Center. Afterwards, the festival will be in the Civic Center Plaza, where visitors will enjoy one of California’s largest St. Patrick’s Day celebrations. There will be booths featuring all types of Irish culture from food and drink to dancing and music, as well as a ride-filled kids’ area. Date: March 12, 2017 at 9:00 a.m.
Another annual San Francisco St. Patrick’s Day event is the 5K run at Crissy Field. With the start line located at this picturesque spot, the race course will wind along the edge of the city to Fort Point before switching back. Registration is only $5 for adults and $3 for kids 11 -17. There is also a half-mile race free for kids 12 and under. Free parking is available and every race finisher will earn a ribbon. The Irish-American Crossroads Festival is a month-long celebration of Irish culture and heritage. Now in its 14th year, the festival is comprised of a multitude of events at various locations throughout the greater San Francisco area. Happenings include everything from book launches and workshops on family histories to film screenings and concerts. Pricing for events varies and many events are free and open to the public. 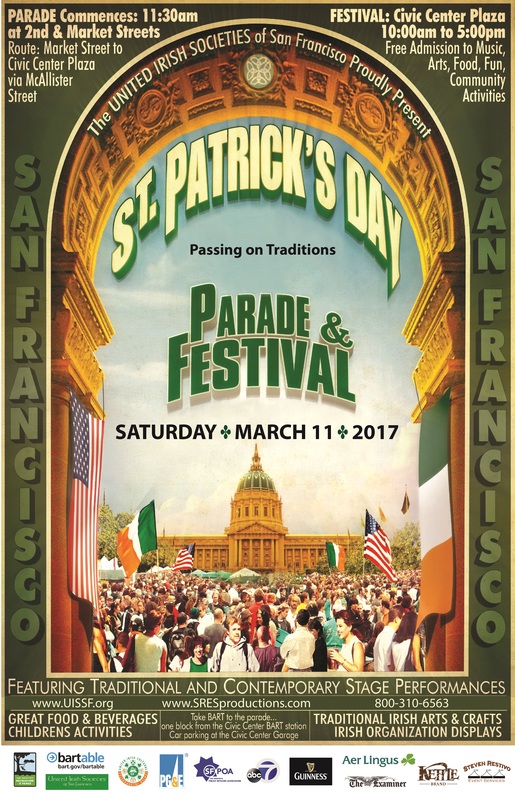 Date: March 18 – 19, 2017 from 10:00 a.m. to 5:00 p.m.
Each year, the East Bay city of Dublin puts on one of the biggest St. Patrick’s Day celebrations around. The weekend’s activities are centered around the festival at Dublin’s Civic Center and also include Friday night’s “Green & White Gala,” a Saturday morning parade and a Sunday morning 5K fun run. Those looking to give back to the community can also attend a special benefit pancake breakfast on Saturday for the Alameda County Firefighters. Festival attendees may enjoy perusing more than 200 booths of Irish clothing, jewelry and music, the international food court packed with Irish food and drink, an Irish tea cottage and plenty of Irish music and dance. This St. Patrick’s Day weekend, the San Carlos based Hiller Aviation Museum will be holding a special holiday themed event. Coined the Flying Leprechaun, the event will showcase the magical spectacle of daring leprechaun leap out of a high-flying helicopter. Kids will also enjoy all manner of festivities such as a jump house and face painting. Every child who wears green will also receive a special commemorative toy. Admission to the Flying Leprechaun event is included with the price of museum admission.